Two years later, there was not one. 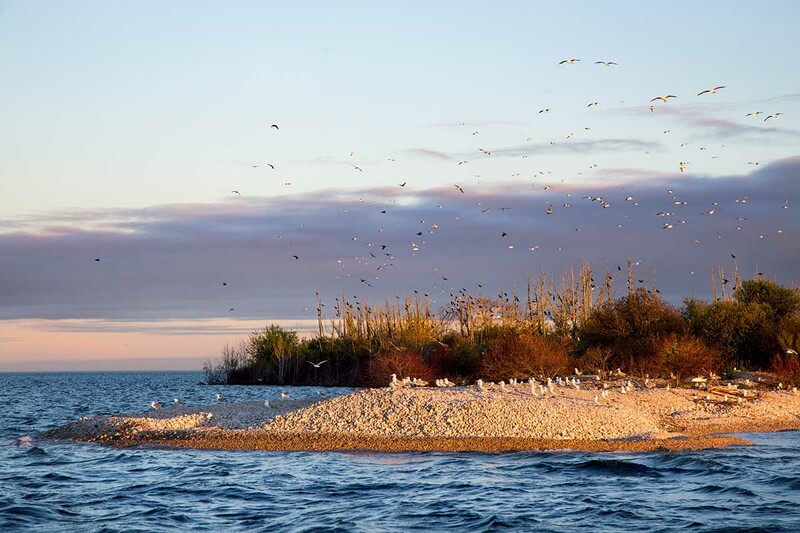 Goose Island, about 10 miles northeast of Mackinac Island, had been a popular place for colonial waterbirds to nest in the Great Lakes, and not just cormorants. Blue herons and night herons nested there, as did herring gulls. In all, there were probably 3,000 nests on Goose Island in 2004. “We’re talking 6,000 birds just gone,” Cuthbert says. 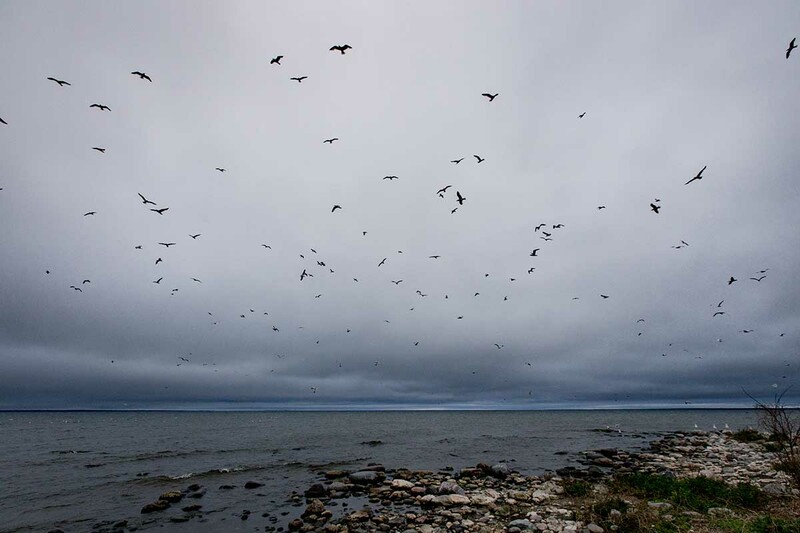 The birds had been chased off by racoons, brought to the island in a boat by Chet Romanik, a hunter from Cheboygan. When Romanik saw the cormorant colony on Goose Island, he saw a threat to one of his favorite places to hunt rabbits. Cormorants destroy vegetation with their acidic feces. A large colony could turn a forested area into open sandy place with no cover for a hare. So Romanik released more than 30 racoons on the island over two years, after keeping them on a strict diet of chicken eggs. The racoons would not harm adult birds, but they would raid their nests for eggs and chased every colonial waterbird from the island. Romanik is proud of what he did. “I did it to preserve the island,” he says. The view that double-crested cormorants are an invader that threaten the natural integrity of the ecosystem is a common sentiment in upper Michigan. Lethal control of the birds to protect wild fish was authorized by the U.S. government for many years ‒ though not through raccoon militias. The control reduced cormorants in the region by about two-thirds. Anglers and congressmen are now renewing calls for lethal force. Cormorants are large, glossy black birds. They’re found all over North America and nest in the spring on remote islands in the Great Lakes. During breeding season, their throats are bright orange and their eyes emerald green. That’s also when the tufts appear that give them the name double-crested. Even James Audubon had a mixed reaction to cormorants. He wrote that they ate and defecated “inordinately” and had no song to charm, only grunts. 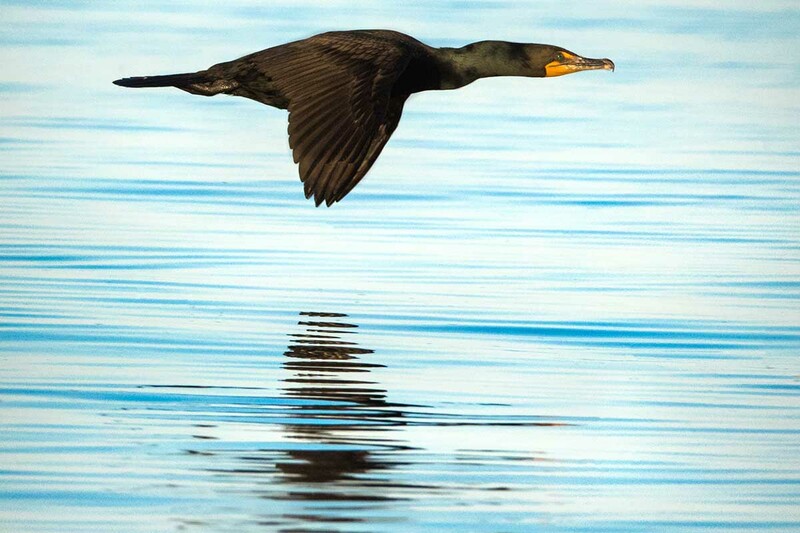 Double-crested cormorants were decimated nationally in the 20th century by the use of toxic pesticides like DDT. 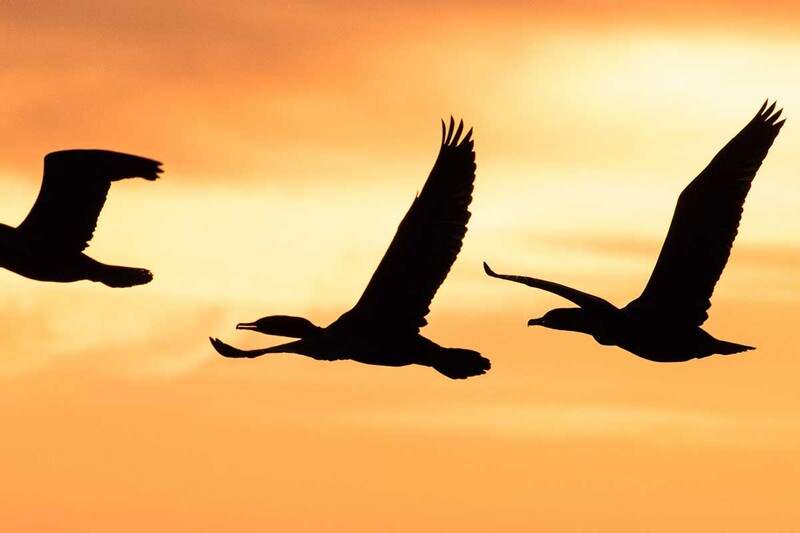 Banning these chemicals and adding the bird to the Migratory Bird Treaty Act allowed their numbers to rise dramatically in the 1980s and 1990s. The population in the Great Lakes went from a few thousand birds in the 1970s to a peak of 115,000 nesting pairs around 2000. The dramatic rise was seen as an invasion ‒ even though the bird’s native range includes the Great Lakes ‒ and a threat to popular sport fish like perch and bass. 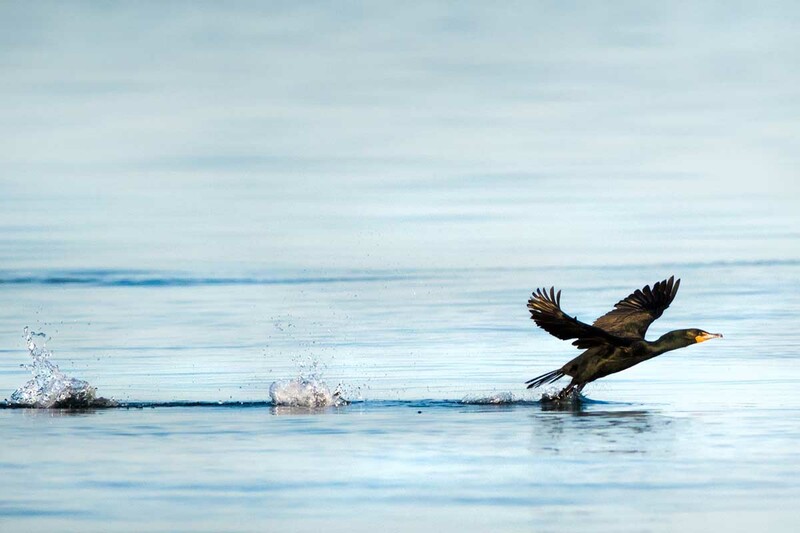 In the Les Cheneaux Islands, some research shows that the collapse of the yellow perch fishery around 2000 corresponded closely with rising cormorant numbers. This graph shows, in blue, the amount of perch caught in survey nets around the Les Cheneaux Islands in northern Lake Huron over nearly a half century. The number of cormorant nests are shown in red. 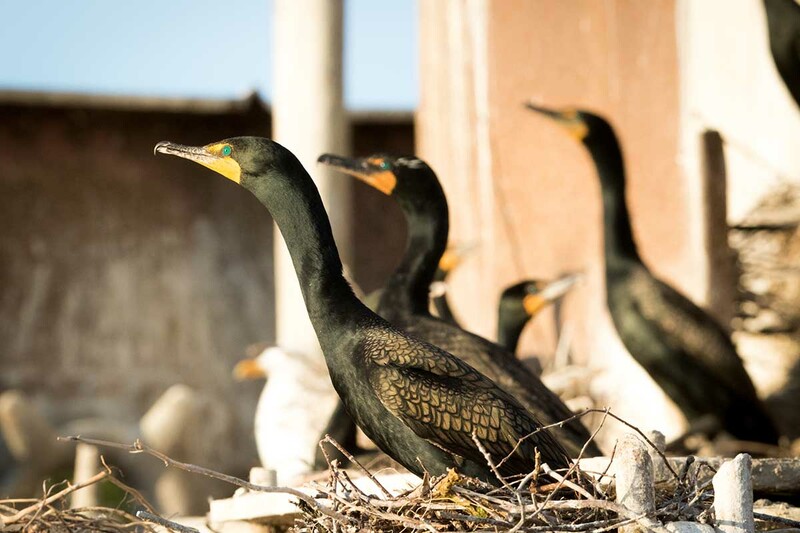 Research by David Fielder of the Michigan Department of Natural Resources and his colleagues indicates the collapse in perch numbers in the 1990s corresponded to increased cormorant nesting in the region. His work has been criticized by ornithologists and Jim Diana, a fisheries biologist at the University of Michigan. Fielder says he remains confident in his work. There was conflict elsewhere too, with catfish farmers in the South fending off cormorants in the winter. Cuthbert, the ornithologist, says back then the U.S. Fish and Wildlife Service had staff that did nothing but deal with cormorant complaints. “Cormorants caused unmeasurable stress,” she says. In 2003, U.S. Fish and Wildlife gave widespread authorization to use lethal control methods to protect sport fish. Altogether, well over half a million birds have been killed this side of the Mississippi since 2000 and countless eggs sprayed with oil to keep chicks from hatching. A federal judge temporarily shut down the control program in 2016, saying Fish and Wildlife had failed to submit an assessment showing depredation remained necessary. When the ruling came down, residents of coastal communities in the Great Lakes expected the federal agency to quickly do some homework, return to court and prove control is still necessary. So far, that has not happened, though the government announced last year that individual lethal control permits would be granted on a case-by-case basis if the applicant could show proof of damage or safety risks caused by the birds. 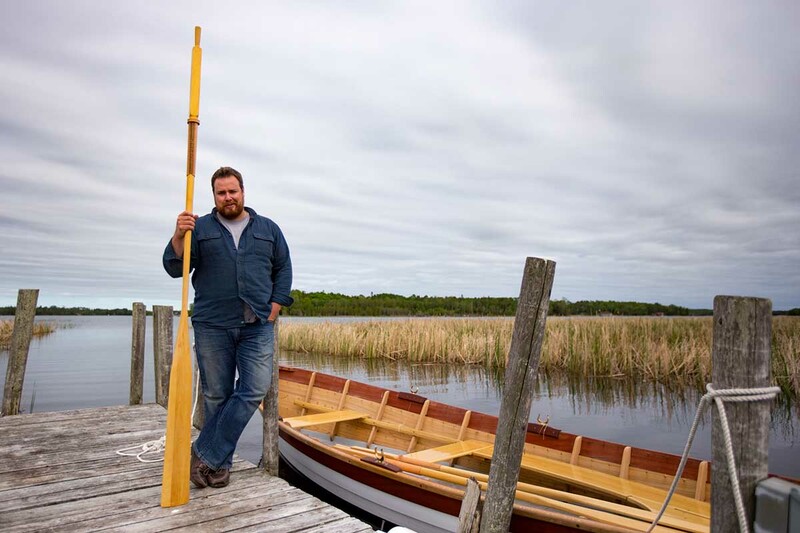 Back in June, Jeff Powers anchored his boat up alongside the east end of Whiskey Island. He pulled out a drone and sent it buzzing over a colony of cormorants nesting in a swath of dead trees along the beach. As the drone made its way over the land, Powers was surprised to see how far the dead trees extend into the island. 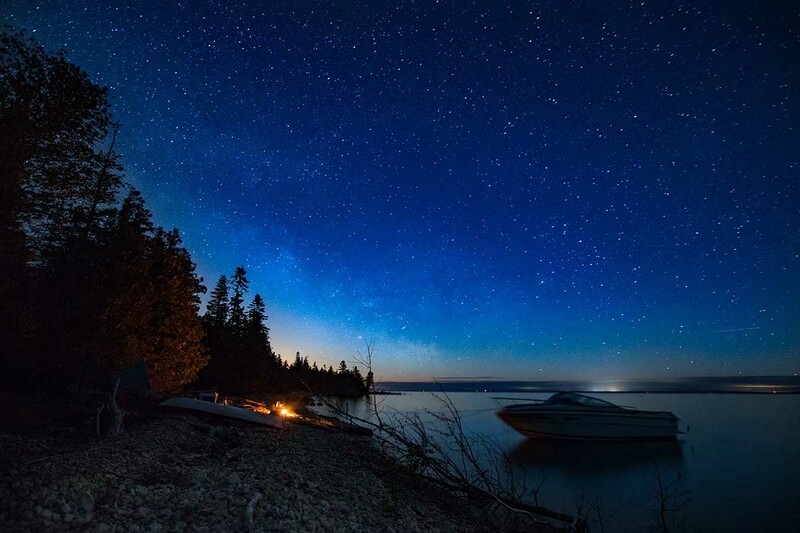 Whiskey is part of the Beaver Island archipelago, a remote set of islands in the middle of northern Lake Michigan. 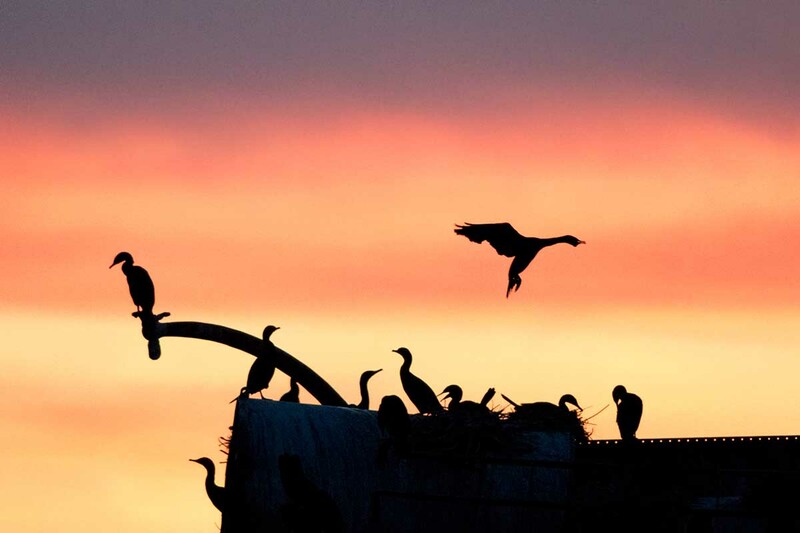 More than 11,500 cormorant nests were counted here in 2007. Fewer than 2,000 were counted two years ago, thanks to lethal control. Powers helped coordinate that effort. Now he’s worried their work is being undone. Island residents think bass and perch fishing has improved since the birds numbers were brought down, although the ecosystem is too big and dynamic to prove cormorants caused any problems with sportfish. 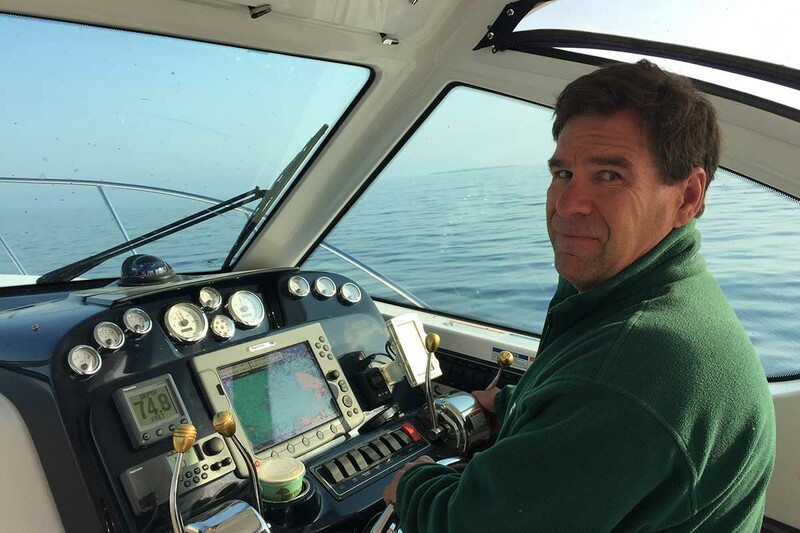 Powers is a veterinarian and angler who also owns the hardware store on Beaver Island. He sees cormorants as an invader. Surveys done a century ago found few of these birds in Lake Michigan and they were never known to nest in this area. But some ornithologists say they see no danger of cormorants becoming super abundant in the upper Great Lakes again. Jim Ludwig has been studying birds here his entire life. He says what happened in the 1980s and 90s was unusual because the lakes were full of little fish like alewives and smelt, but very few predator fish were around to eat them. “I’m fond of saying that all a colonial waterbird had to do was fly out over the lake and open its bill and fall in and it’d have a fish,” says Ludwig, an American scientist who lives in Canada and works independently. But the amount of fish in Lake Michigan has been in steep decline now for 20 years and is at record low levels. Ludwig says people who still want to use force against cormorants might as well come out and say that all fish should be considered for human sport. Because Ludwig he has no affiliation with a university or agency, he says he is free to criticize government policy and was in fact a plaintiff in the lawsuit that stopped cormorant control in 2016. He is one of the few public advocates the bird has. Ludwig warns of a larger issue in all this. He says humans are in danger of forgetting what a natural system looks like, while the planet gets crowded and warm. Ludwig’s view might be seen as ludicrous in places like the Les Cheneaux Islands region. 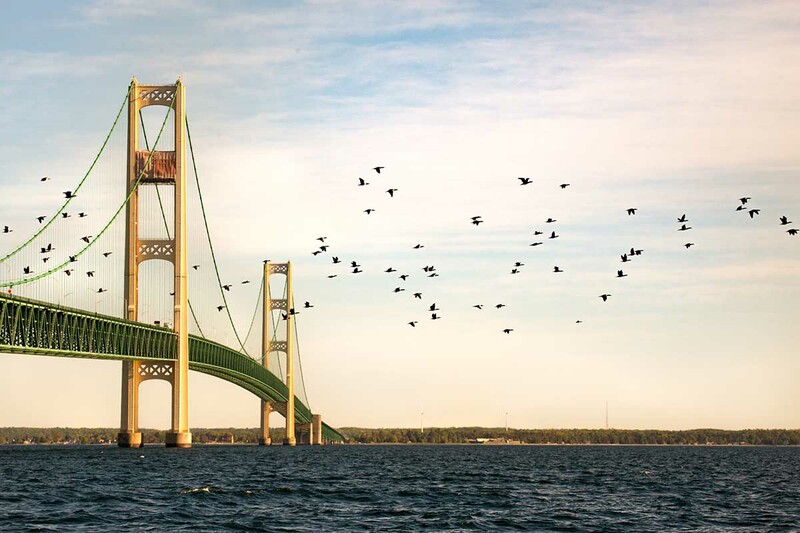 The number of birds nesting in that island chain is less than a third of what it was at its peak, but fisheries biologists at the Michigan Department of Natural Resources estimate that cormorants still eat at least twice as many perch as anglers catch there. From the perspective of islanders, the birds remain an existential threat. It does not appear the matter will be settled by scientific or ethical debate. In June, a congressional hearing was held in Alpena to address the “mismanagement” of cormorants. Jim Ludwig offered to speak but no public comment was allowed. The lawmakers holding the hearing were candid about their purpose: restore the use of lethal control against cormorants. U.S. Republican Rep. Jack Bergman, whose district covers northern lower Michigan and the Upper Peninsula, said wildlife conservation and economic interests can be balanced. Arkansas Rep. Bruce Westerman said federal judges and agencies need to listen to the locals. “The people who deal with a problem daily usually know what works and what does not work.” he said. Bergman introduced legislation that would direct the U.S. 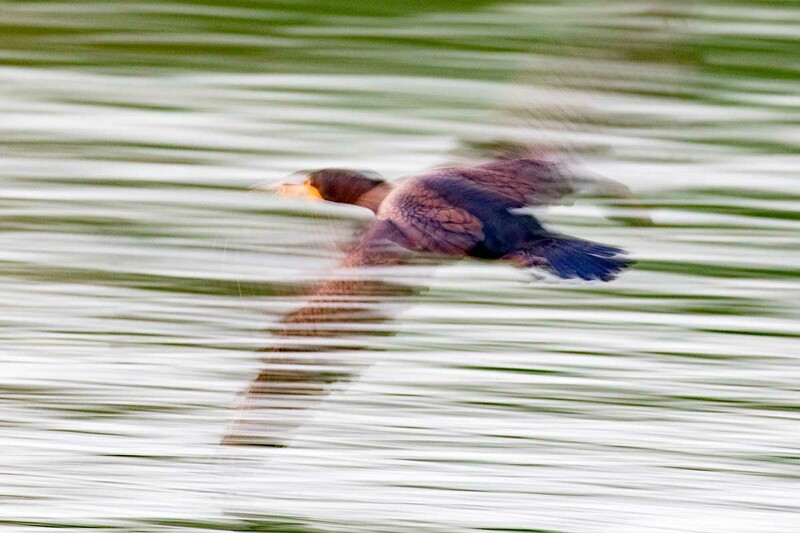 Fish and Wildlife Service to restore the use of lethal force against cormorants. It passed out of a House Committee in July. But the bill might not be necessary. U.S. 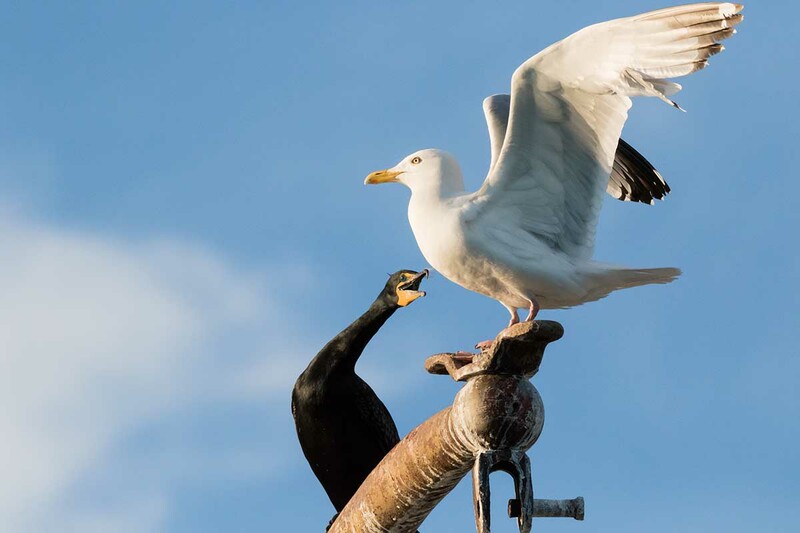 Fish and Wildlife is already issuing permits to fish farmers in the southern U.S. to kill cormorants. On Thursday, the federal agency is scheduled to host a meeting in Lansing with state and tribal officials to explore whether control is again needed in the Great Lakes to protect wild fish. Another perfect example of Federal government one size fits all regulation. Similar to case in Northwest where Federally protected sea lions congregate at dams to devour truly endangered Steelhead and Salmon and nothing can be done. And once in place, such regulation is almost impossible to get rid of no matter what the outcome. All regulation should have a sunset date so to be re-evaluated, revised and renewed (maybe) every 20 years. But Cormorants are truly the Ticks or Small Pox virus of the Avian world and still waiting to see any reason they would be missed! I have watched the sea lions harassed and shot at with cracker shells at the Bonneville Dam. It's ridiculous and futile, but it's not because we haven't been creative enough in our methods of selectively killing wildlife. If you're looking too closely at federal regulation, back up and look at a literal federal dam. Nothing can be done for salmon? Things are out of whack not because of the existence of sea lions but because of a network of dams that has destroyed the great river of the West. Similarly, if you want a cataloguing of things that are threaten the Great Lakes, scroll down for John Austin's column below for some examples. We all know others. Cormorants aren't the reason our fish are toxic, or that we have algae blooms or industrial waste, or even invasive species (you'll note that cormorants did us a great service by feasting on alewives). The people we trust to manage our waterways have a huge job keeping this natural system in balance, or at least working to keep it as closely resembling a functioning natural system as its degraded condition allows. We don't get there by jumping beyond the science and putting one interest ahead of the rest. Simply put man kind has been changing this environment to suit his wishes since we've been here on Earth. Cormorants are no more a part of Michigan's environment than are Lamprey Eels and I hear no one fretting over killing them. I doubt you'll get any agreement that Cormorants did us any favor in anything, the Salmon and Steelhead had them under control before anyone even knew Cormorants existed. One can argue whether dams, Sea Lions or cormorants are good or bad, but the fact still remains there is very little "wild" nature that exists without showing significant human influence and arguing that somehow allowing a species population to explode in new deemed harmful ways in the name of preserving the balance of nature is ignoring reality. And I'm not sure how you imagine salmon (a non-native fish stocked in the Great Lakes very recently) have kept cormorants (a native bird) under control, but I assure you that they weren't a secret all these years. My argument isn't that we will somehow reclaim "wild" status in the Great Lakes (or in the Columbia River basin, for that matter). It's that the systems are much more intricate, with many more interconnected parts, than most people understand. I want people who have worked their whole lives trying to understand these systems to drive the policy decisions here, not rogues with boatloads of raccoons. Justin, Salmon, lake Trout and Steelhead kept Alewives under control , not Cormorants. Actually converted them into a beneficial species. Sea Lampreys are indigenous to the Atlantic watershed, (They eat them in Europe!). Chestnut Lampreys different species, were also indigenous to the Great Lakes areas. Sea Lampreys expanded their range (not introduced) into the Great lakes and their population exploded - just like Cormorants. There's very little difference in the two cases, except we kill Lampreys because they're ugly and they eat and kill fish we find desirable. We have problems with killing Cormorants (for protecting game fish again), because they're birds(?) and because of Federal laws designed to address other issues, (even though they're also ugly!). The idea that we can't or shouldn't manage species populations is based on ideas and an environment that are long gone especially here. OK, if the cormorant has few friends, count me as one of them. You want plentiful fish and zero other wildlife? Go to a fish farm and have at it, sporty boy. The Great Lakes are a hugely complex natural system, and people only concerned with one piece of it ("how many perch did I catch in Les Cheneaux") should not be making decisions on how to manage it. I agree with Mr. Carinci. The cormorant removal plans are like the wolf and bear removals in the west....in the Anthropocene era we feel we can control the parts of nature that we don't like at the moment, without looking at the larger picture....perch in the Great Lakes or Nestle sucking up Great Lakes water to sell for a profit. Oiling the eggs works as a control for population levels without harming the adult birds. The problem would lie in what the appropriate level of cormorants is acceptable. Man will always mess up the balance of nature. Keep man out of the equation and nature will run just fine. Some may not like what the natural balance is butso be it. Some places maybe. As far as the Great Lakes you're only 300 years too late! And that cat or Cormorant isn't going back into the box. My observation is that the cormorants have probably the least-efficient diet / digestion / defecation process ever imagined. We have had a sailboat in Northeast Michigan (Presque Isle Harbor) on a mooring and, within a week during the fall migratory period, cormorants have perched themselves on the mast spreaders where they can spot and pick out their appetizers, main courses, and dessert from a 30 foot vantage point. A veritable smorgasbord. Since a boat at anchor always points into the wind, they sit on the spreaders, after each course, and expel a sludge of only partially-digested fish onto the deck and cockpit of the boat. That highly-acidic sludge not only coats the deck and canvas (up to an inch thick) but also damages the deck and fabric. I always admired the flights of cormorants, with their sleek profile and gloss, but when their populations grew, the feeding frenzy that ensued was very damaging. Like with many things, too much of a good thing always has a negative side. While I don't know what a "healthy population" of cormorants would be, I also don't know what benefit they provide in the natural balance. Controlling the population seems to make more sense than allowing it to balloon and allow the indiscriminate decimation and defecation of the feeder fish that also support the larger fish species. Unchecked, they seem to get out of control.